We all know the Ghibli Musuem is in Mitaka, Tokyo. In fact, there is a legend in Mitaka that says if you stay in there, you will not die! It is “In Memory of Helen Keller”, it was designed by world-renowned Japanese artist and architect Arakawa and Madeline Gins, it was design based on the concept of “a home where you will not die”. One part of the house is for renting, another part of the house is widely used for educational purposes and cultural events. Every corner of the house is covered with sunshine and the colourful designs make people happy. Source: http://www.rdloftsmitaka.com/images/archives/_DSC0016.jpg To go to the balcony, you have to climb over the small door, the house is decorated with different heights of floors and a playful designs. The purpose of such design is to keep people active in the home. No matter at what their age, you must always keep curiosity in your mind, always be ready to try out new things and keep your mind young. It is a happy concept, it makes you want to get to know the local residents! Looking at the pictures, it really looks like it was taken at a small coastal village in Greece! In fact, this Shima Mediterranean Village is located in Shima, Mie Prefecture. The houses and streets really look like those in Greece, together with its location, it is next to the sea facing the Ago Bay, and it makes you feel like you are in Greece! The European-Style Street is made off slate; the street is full of red and white brick vacation bungalows which add on to the vacation atmosphere. Besides hotels, there is also a handicraft store and fishing and swimming activities in the village, the village also offers massage services and Mediterranean cuisine. It is worth the visit! Even though the public transport here is not very convenient (it is best to drive or take a taxi or shuttle bus from the nearest station, Ugata Station), but you will definitely feel like you have come to Greece when you are here! Speaking about garbage landfills, you may fee dirty, stinky and wouldn’t want to visit it. However, in Osaka, there is one garbage landfill which looks like an amusement park! 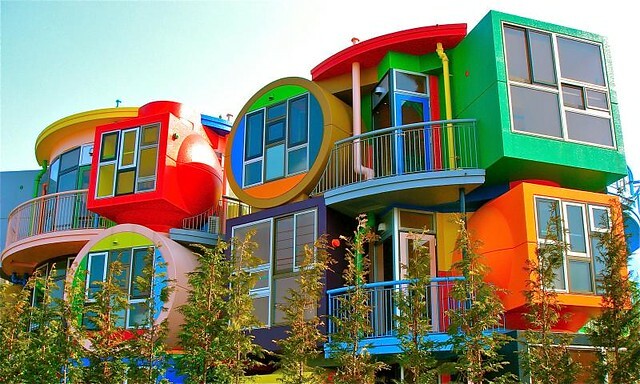 It is near Universal Studios which is located in Osaka, designed by Austrian Architect Friedensreich Hundertwasser, known as Maishima Sludge Center. It is 33,000 square meters, the building is designed with irregular lines, arcs and fillets that look hand-painted. Many people would even think that it is part of Universal Studios! It attracted 16,000 visitors which includes foreign tourist. Three Ways to Enjoy Nagoya’s Famous Hitsumabushi!